For several years there was one excellent hope for improved quality of life for those living with Parkinson’s Disorder – a novel rehabilitation program called “ BIG . “ This program was appropriate for all stages of PD. LSVT BIG is a research-based exercise approach developed to increase flexibility, improve balance, and increase walking speed. The creators of LSVT BIG have further enhanced the program by evolving the exercises into more encompassing movements to address motor pattern sequencing. The NEW program is called Parkinsons Wellness Recovery or PWR4Life program. Austin Physical Therapy is proud to have a Physical Therapist with certification in this new and dynamic approach to treating PD. PWR!4Life™ is not a static or singular approach. 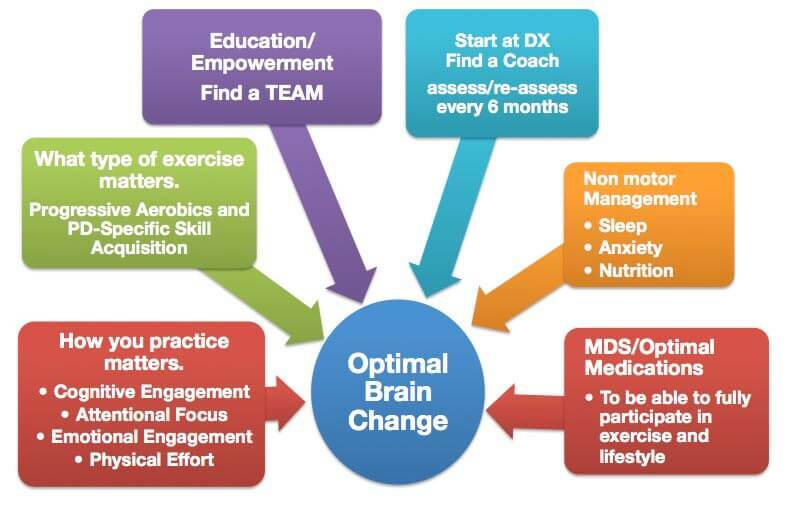 It is a comprehensive neuroplasticity-principled program that integrates the latest research on Parkinsons disease and Rehabilitation, Exercise, and Wellness. Therefore, it is always being updated. This type of research-based integrated exercise and wellness programming is necessary to counteract the inactivity, motor deterioration, and symptoms of PD. PWR!4Life is a PROACTIVE program that allows you to optimize your brain change (neuroplasticity), brain repair, and increase your desire to participate in everyday LIFE. Therefore, it should start at diagnosis and continue “4 Life”! With early intervention and ongoing programming, you can GET BETTER and STAY BETTER. But better yet, your efforts may trigger positive brain changes (neuroplasticity) that are disease modifying and thereby, contribute to slowing the disease progression. A PWR!4Life Program is about more than exercise! It is also about empowerment – teaching you what you CAN do to use your FULL potential and get the most out of life. PWR!4Life is also about removing barriers to optimal brain health and repair by addressing the non-motor symptoms that interfere the most with your ability to participate in exercise and LIFE. For example, stigma, stress, poor nutrition and non-motor symptoms like anxiety, sleep problems, apathy, and pain are pro-degenerative and thereby, make Parkinson’s disease symptoms worse! Research shows that medications and exercise act in synergy. Optimal medications enhance your ability to optimally participate in exercise and life – which in turn may reduce the amount of medications you need over time! Just like you see your physician every 6 months to optimize your medications, you need to see your PWR! Therapist (Coach) to update your exercise and wellness program. Research suggests that WHAT you do is important! The WHAT you do should be about vigorous aerobic exercise and PD-specific skill training. The skills that deteriorate in PD interfere with everyday movement, therefore, movements become slow, small, and poorly sequenced. To maintain or restore those PD-specific skills, a PWR!4Life Program involves the daily rehearsal of big and fast, whole body functional movements – these are called the BASIC4 | PWR!Moves. Studies suggest that the combination of these types of exercise (aerobics and skill training) may enhance learning and automaticity beyond what is possible with either one alone! To schedule a free information session, or get started with a PWR Certified therapist right away, call Austin PT at 256-883- 9494. We have our centers at Huntsville & Brownsboro, AL.